Plan your hike with a Trail Map, or pick one up at Guest Services. Enjoy a short stroll through paper birch and trembling aspen where beaked hazelnut and dogwood shrubs flourish. This 20-minute loop winds behind the nature centre along the river valley bank. Some steep sections may be a concern for those with limited mobility. Many local tree and shrub species can be found along this trail that loops around Fort Edmonton Park. The hillside section of this multi-use and paved trail starts at the Nature Centre and leads to the Fort Edmonton footbridge. 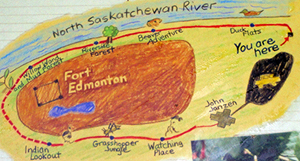 The riverside section parallels the bank of the North Saskatchewan River. Some steep sections may be a challenge for those with limited mobility.